Through encouraging citizen participation, reforming and creating an outstanding image of New Taipei City Government is one of the short-term and long-term strategies for the future to reach Open City Governance. Under this situation, it requires a kind of mechanism for the government to make information public and let the people participate in it. Through the expressions of diversified views and the bottom-up model establishment of decision-making, people in need get involved in planning, decision-making, and implementation projects of citizen management more efficiently and transparently. 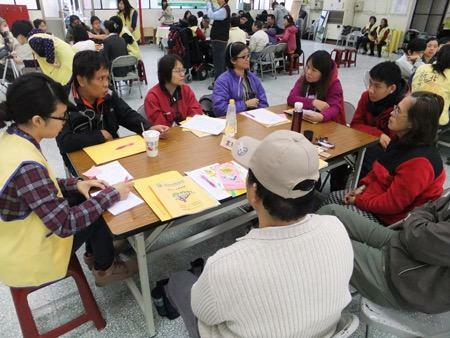 New Taipei City decided to adopt the Participatory Budget (PB) in 2015. The city government propelled participatory democracy and pushed the society forward progressively. They established a novel paradigm of participatory budgeting in the area of power-saving, employing PWD (Persons with disabilities), and so on. The Labor Affairs Department of New Taipei City Government developed the first participatory budgeting project in the world about the employment of PWB in Sanxia District and then was voted by approximately 2,900 people. PWB were usually vulnerable to unemployment owing to their congenital and acquired condition limitation. There were still many obstacles for them to overcome. To promote the ideas and concepts step by step effectively was the first challenge to the project team. All of the PWB could gain access in a virtual social environment such as Facebook and platforms. Sometimes they also arranged these people as consultants to services. They also offer pick-up service for the people in remote areas, sign language interpretation; Assist with typing for the hearing impaired, enlarged version documents and advertisements for the disabled people. There are four steps for participatory budgeting: brainstorming, proposals, voting and implementation and monitoring. In the process, we looked for practical actions or feedback to meet their real needs. During the Street Corner Forum, there were sixteen groups in total attending the discussions, and they did five potential projects. In the end, those who were looking for jobs and aged 15 to 64 were eligible to vote for the ideas and the most second votes were the final projects that would be adopted. For a successful implementation of Participatory Budgeting, and avoiding the possibility of unreasonable demands made by the citizens, it is important to maintain transparency and make the citizens aware of the financial situation and constraints of the municipal administration. The PB contributes to the building of consensus between social sectors with conflicting interests. Disabled people thought it’s always difficult for them to participate in a policy-making process before, however, their voice is heard through the engagement of participatory budgeting this time. Owing to the advent of the Internet, providing simplified educational resources and an easy-to-use platform for the citizen’s participation is a trend for the future.